There are hundreds of sink options available online and at our surplus center. 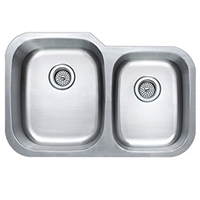 Our sinks can be broken down into several different categories based on how they are fitted to the countertop. Undermount Sinks are installed underneath the actually countertop so that less of the sink is showing, which is a very popular design that creates a seamless look. Topmount are the most common type of sinks that are seen in bathrooms. This style sits directly on the countertop. Less costly to install and capable of being adhered to many different countertop types. Vessel Sinks sit directly on top of the countertop and creates a centerpiece for the bathroom. This style will give you a lot of depth and can hold a lot of water. Shop online or visit our showroom in Farmer’s Branch, Texas, for all your home decor needs. SBMTX offers the best quality products at surplus prices. 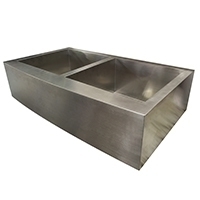 Stainless Steel Utility Undermount Sink 21-1/4"x16-1/2"x9"
Stainless Steel Apron Front Sink 50/50 Basin 36"
Stainless Steel Undermount Bar Sink 16"x16"x8"
Stainless Steel Apron Front 50/50 Kitchen Farm Sink Basin 33"
Stainless Steel Apron Front Kitchen Farm Sink Basin 36"
Stainless Steel Apron Front Sink Single Basin 33"
Stainless Steel Triple Kitchen Sink - 46"x20"x9"